I live in the great Northwest. If you are a golfer in the great Northwest, then you need to possess two important qualities: You must be able to drink copious amounts of coffee, and you must have gills. We golfers that go out in the drenching rains (that are common in the Northwest), we call ourselves "Mudders" -- and we know how to stay dry. 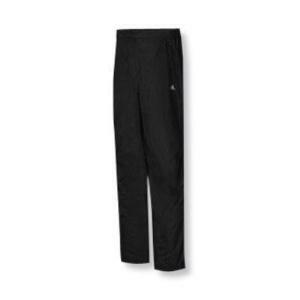 These Adidas ClimaProof Rain Pants are one of our secret weapons. They are made of 100% polyester microfiber with a polyurethane coating. They are fully seam sealed and completely waterproof. They slip on very easily over your golf slacks, or shorts. The best thing about these is they are extremely lightweight and will fit very easily in your golf bag, and I love the one-year waterproof warranty. Of course you won't need it, as these pants are going to keep you dry. So bring your rain pants and come to the Northwest and play some golf. You may even be joined by one of us "Mudders." Keep in mind, though: don't get in our way, because we will be "hopped up" on caffeine and trying to finish our round before "the real heavy stuff" moves in.